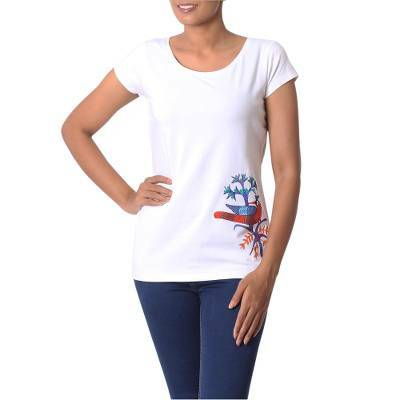 Hand Painted Madhubani Cotton Blend T-Shirt from India, "Peacock Brilliance"
A colorful peacock rests in a tree on this white t-shirt designed by Vibhanshu and Tamanna. Using the Madhubani style of painting native to Nepal and India, the artisans hand-paint the design in vibrant shades of blue, orange, and red. Comfortable and casual, the round-neck tee is made from a blend of cotton and spandex.